The year was 2008. Mario and Sonic were on their way to the Olympic Games, the 3DS was but a twinkle in Satoru Iwata's eye and the housing bubble was on its way to bursting. 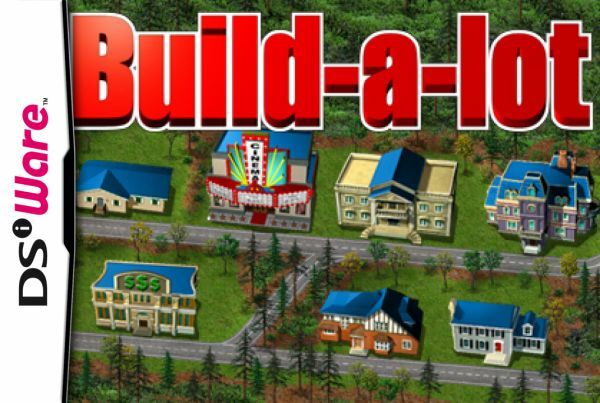 You wouldn't know that last fact, however, from MumboJumbo's 2008 real estate celebration Build-a-lot, a retail DS adaptation of HipSoft's 2007 PC game of the same name. 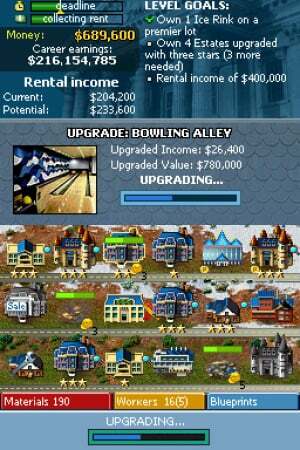 Now, four years after its original appearance, Build-a-lot is back on DSiWare, the main difference being that this has fewer levels – but has this old house aged well, or does it deserve to burn to the ground? The gameplay here is simple at its foundation, which is probably why the "Premium Casual Games" banner fit its original retail box art so well. It sees you take the daring role that video games were created for – the real estate planner. You've got your money, your materials, your blueprints and your workers, all of which you'll need in specific quantities to achieve certain tasks. The game presents you with a number of lots: some built upon and some empty, some owned by you and some that you can buy. On them, of course, you can build houses; these come in six categories, each of which is better than the last. There are drawbacks to the more advanced residences – greater material expenditure, higher property tax, more workers required, etc. – though the increase in the cost of rent makes it worthwhile. You view the neighbourhood from above with no scrolling about, each screen containing around ten lots. There are also special buildings at your disposal, such as a workshop and a bank, which alter gameplay elements – owning the former will allow you to inspect houses, meaning that they will never need repairs, and hire workers for half the cost, while constructing the latter will net you some interest or allow you to bypass property taxes once they're introduced. In the main mode, Career, you travel from town to town filling mayoral requests to improve the community. This generally involves a combination of constructing X amount of a type of house, having X dollars in the till, upgrading Y houses by Z stars and so on, all within a time limit and a bonus incentive to complete within an even smaller boundary. Casual Mode, on the other hand, swaps the countdown for a timer and a high score list and only tasks you with earning a certain amount of money. When Career Mode gets it right, it can prove a lot of fun to try to accomplish everything within the allotted time. That's only within certain bounds, however, as the gameplay itself is so straightforward. 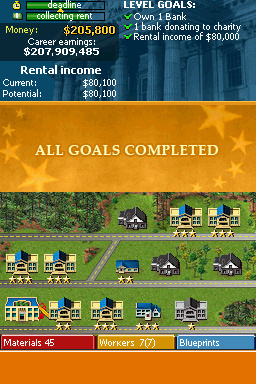 You click a property, choose an action, then continue or wait for the workers to finish. You use up your cash and then wait for the next rent collection, which happens relatively quickly but doesn't feel like it in the more difficult stages. You make sure that you're not upgrading or inspecting a house when pay is collected as these properties are temporarily exempt from rent. As the challenge builds you'll find yourself juggling more and more tasks, creating a fairly high level of entertainment that's tempered by the fact that those tasks are so simple. This is not only true in their physical execution but in the level of intuitiveness it allows you. If the objective requests seven mansions, for example, you probably won't start with enough materials, workers or cash to make it happen, not to mention the essential blueprint, an item that generally costs an exorbitant fee. So you start small but not too small and work your way up, again and again in each level, usually in much the same way. There is some strategy involved – which special building to utilise? Should you begin by constructing the low-cost, low-rent rambler, the high-cost, high-rent, high-property tax mansion, or somewhere in between? – but it's within a very limited boundary. As Casual simply removes the time limit, the one feature that really makes Build-a-lot enjoyable, you'll find little reason to visit there. Beyond the very simple gameplay, the difficulty curve sharply spikes about halfway through Career Mode, going from tediously easy to, at times, maddeningly difficult. The biggest kink is property tax – once it's introduced, it can easily become your bane. You'll quickly learn to make your first residence a simple, cheap one, as for some reason, as long as you pay it you'll only have to pay tax on this building, which grows and shrinks with the value of the property. If you don't have the money, however, and another of your properties needs repairing, you'll have to wait for your others' rent to fill your wallet enough as these will not earn you squat when payday rolls around. But if your strongest residences are out of commission and you can't make the money in time, gradually more and more of your properties will go up for tax payments and, like a house undergoing inspection or repair, temporarily not make you any rent money. A hole that builds this quickly and inescapably simply feels unfair and irritating. Another of this mode's flaws is the inability to play on separate difficulty levels as the time limits quickly become very hard to satisfy. The visual style is quite bland while still getting the job done, and the layout is easy to navigate, though the repetitive, simple soundtrack is bland at its best moments and atrocious at its worst. Each level is introduced with the mayor's instruction in the form of a large amount of text – so much reading becomes tedious over time, though it's generally well-written. 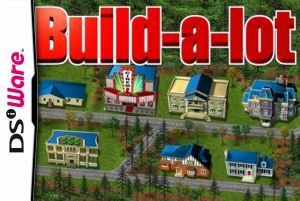 Build-a-lot utilises very uncomplicated gameplay to create challenging objectives, thus providing an incentive to keep going – you just might find yourself dozing off at certain points along the way thanks to the simplicity and repetitiveness of the game. This is a decently comfortable home for the casually inclined gamer, then – it wasn't built with asbestos and it's not growing black mould, but it's no mansion either. Those graphics are retro. Hello early-90's PC graphics. I bought this when it came out in stores. If you like games like this, it is fun. I worked hard to beat it. This doesn't sound TOO awful bad... of course I'm a fan of the genre. @2 Thanks. I was thinking I'd probably get it anyway, but your comment essentially confirmed it. No thanks! I'm saving my points for "1950s Lawn Mower Kids."